Native to south-eastern USA (i.e. southern Florida), Mexico, the Caribbean, Central America (i.e. Belize, Costa Rica, Guatemala, Honduras, Nicaragua and Panama), tropical South America (i.e. French Guiana, Guyana, Surinam, Venezuela, Brazil, Colombia and Ecuador) and the coastal regions of tropical western Africa (i.e. Cameroon, Gabon, Ivory Coast, Gambia, Guinea, Liberia, Nigeria, Senegal and Sierra Leone). 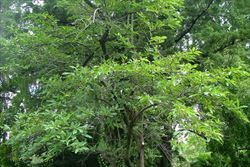 Occasionally cultivated in botanic gardens and widely used as a salt-tolerant and water-tolerant grafting stock for cultivated custard apple (Annona cherimola) plants in northern Queensland. This species is currently almost entirely found in the coastal areas of northern and central Queensland. The vast majority of populations are present in the Cook pastoral district, but there are also a few records from the North Kennedy and South Kennedy pastoral districts. It is also known to be naturalised in tropical Asia and on several Pacific islands. This species prefers wetter tropical and sub-tropical habitats. It generally grows in freshwater and brackish swamps (e.g. 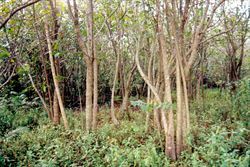 in mangrove communities), along creeks and rivers, in rainforests and along rainforest margins, in coastal environs and along roadsides. 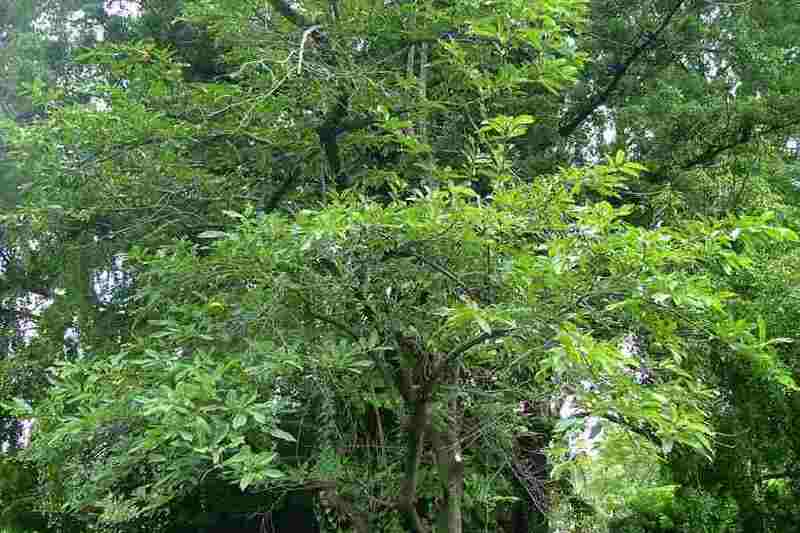 A small tree that usually grows from 3 to 8 m tall, but may occasionally reach up to 15 m in height. It usually loses some of its leaves during the dry season (i.e. it is semi-deciduous). 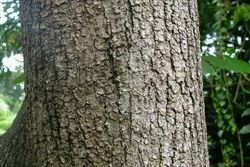 a small tree with greyish bark and a trunk that sometimes becomes butressed at its base. 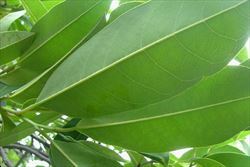 some or all of its glossy green leaves (7-15 cm long and up to 6 cm across) turn yellow and drop off during the dry season. its leathery flowers (2-6 cm across) are pale yellow or cream with a reddish centre. its very large rounded fruit (5-15 cm across) turn from green to yellowish as they mature. The trunks of this species have swollen bases when young and may develop narrowly buttressed roots as they mature. 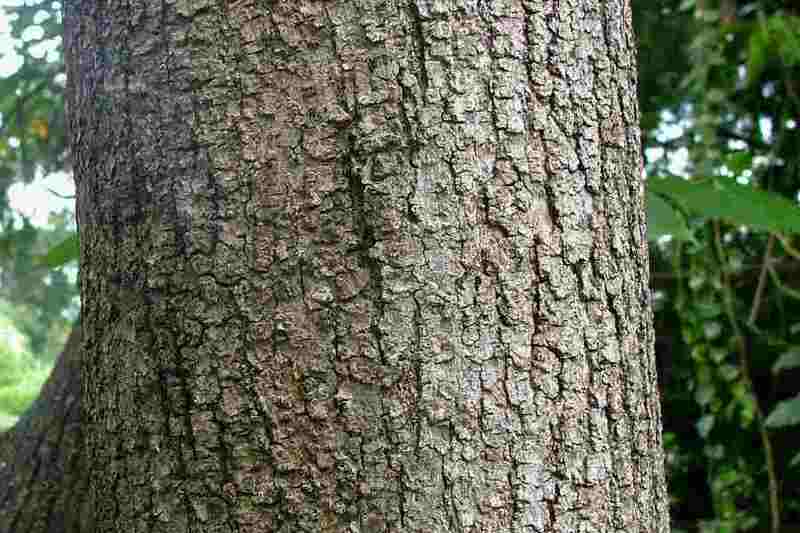 The bark is usually light grey in colour and the branches bear numerous small raised projections (i.e. lenticels). The stalked (i.e. 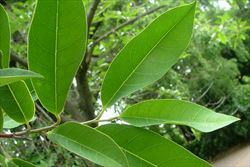 petiolate) leaves are simple and alternately arranged along the branches. They are oval (i.e. elliptic) in shape (7-15 cm long and up to 6 cm wide) and have a prominent central vein (i.e. midrib) on their undersides. These leaves are glossy in appearance, mostly hairless (i.e. glabrous), and have pointed tips (i.e. 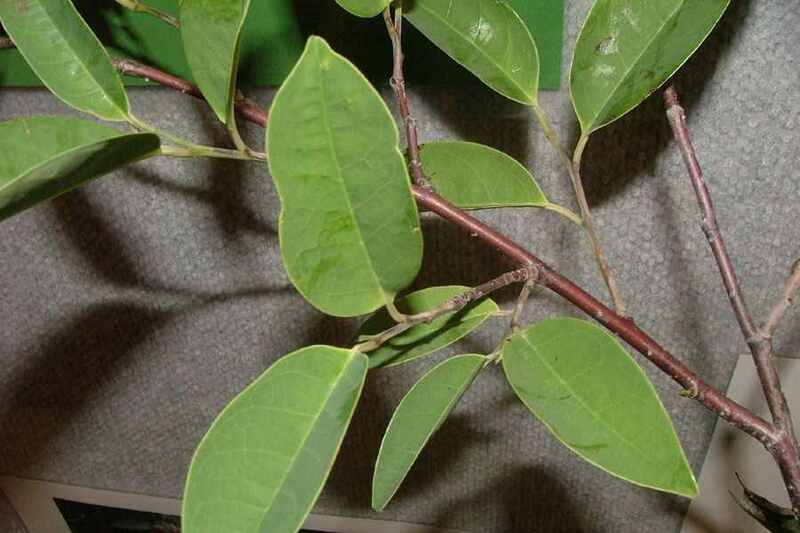 acute or shortly acuminate apices). However, leaves of seedlings, suckers and saplings may be slightly bluish-green (i.e. glaucous) when young. The flowers (2-6 cm across) are pale yellow or cream in colour with a bright red centre. They have three large and leathery outer petals (25-30 mm long and 20-25 mm wide) and three smaller inner petals (20-25 mm long and 15-17 mm wide), as well as three broad sepals (about 4.5 mm long and 9 mm wide). Flowering occurs mostly during summer. The fruit are very large (5-15 cm in size), somewhat round in shape, and initially green in colour. After the fruit are shed they turn yellow (when ripe) and then black (as they decay). These fruit have a pinkish-orange, rather dry, pungent-aromatic, pulp that can contain more than 100 seeds. Each of the light brown coloured seeds is about 10-15 mm long. 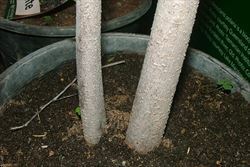 This species reproduces by seed and may also produce suckers from damaged roots and trunks. The fruit and seeds float and are commonly dispersed by water movement, particularly during floods. Seeds may also be dispersed by animals that eat the fruit (e.g. large birds and feral pigs). 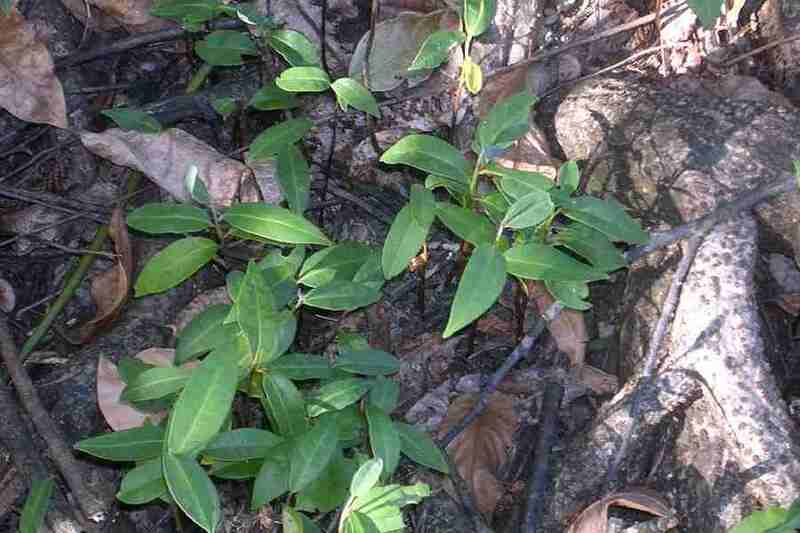 Plants can also spread laterally by suckering, and eventually form dense thickets. 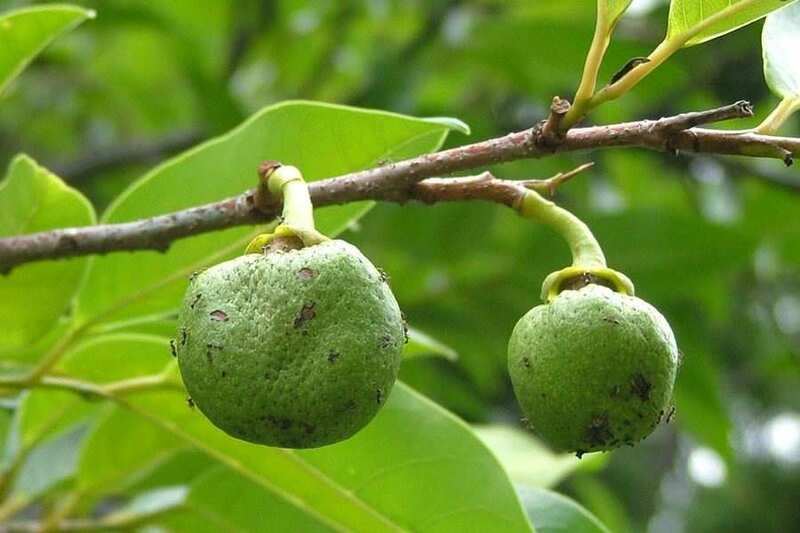 Pond apple (Annona glabra) is a Weed of National Significance (WoNS), and is regarded as one of the worst weeds in Australia because of its invasiveness, potential for spread, and economic and environmental impacts. It is a very hardy and aggressive tree that forms dense thickets and has the ability to grow in flooded areas and tolerate salt water. This species gradually replaces everything else in the canopy layer and can totally transform native rainforest and mangrove vegetation. It also competes with ferns, grasses, shrubs and sedges in the understorey, and prevents the regeneration of overstorey species. This creates an undesirable habitat for wildlife by replacing the plants that they rely of for food, breeding sites and shelter. Unlike many other environmental weeds, pond apple (Annona glabra) can invade and transform undisturbed areas. 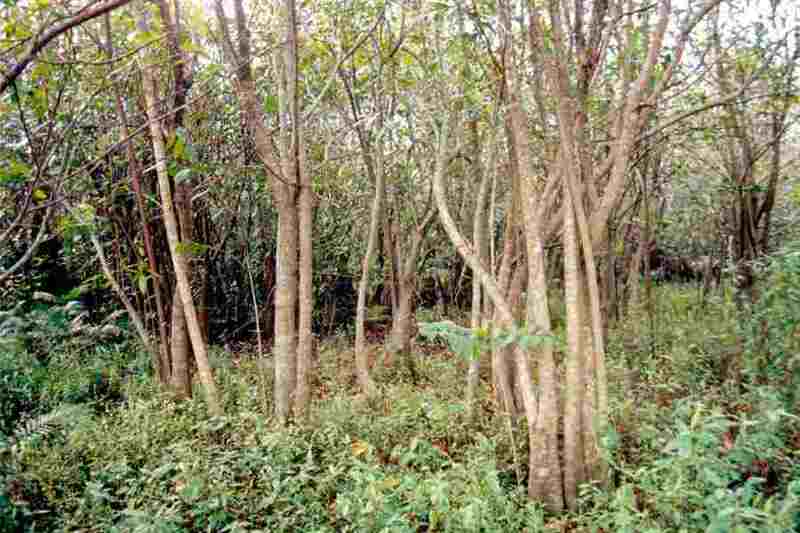 It can germinate in semi-shaded conditions, where its seedlings lie dormant until a gap in the canopy is created. It can also act as a pioneering plant and will opportunistically invade areas after disturbance events such as cyclones and floods. Pond apple (Annona glabra) is currently only a problem in Queensland, where it infests more than 2000 hectares of the wet tropics bioregion in the far north of the state. It is mainly found between Ingham to Cooktown, but has also been recorded as far south as Townsville and as far north as Horn Island in the Torres Strait. 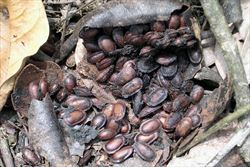 Major infestations occur in the Murray, Tully, Johnstone, Russell and Mulgrave catchments, and in lowland areas in the Daintree and Cooktown regions. 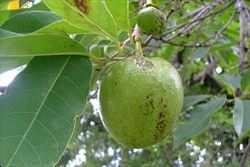 Though pond apple (Annona glabra) it is currently restricted to northern Queensland, it is of concern throughout much of northern and eastern Australia. Predictive modelling has suggested that it has the potential to spread throughout the coastal regions of tropical and sub-tropical Australia, including the Gulf of Carpentaria river systems, the wetland areas of the Northern Territory (e.g. Kakadu National Park), and the coastal strip from of Queensland from Cape York south to Bundaberg. Infestations have most commonly been found in rainforest areas and along creeks, river banks and floodplains. However, it is also relatively common in wetlands (e.g. melaleuca and pandanus swamps and sedgelands), estuarine areas and mangrove communities. 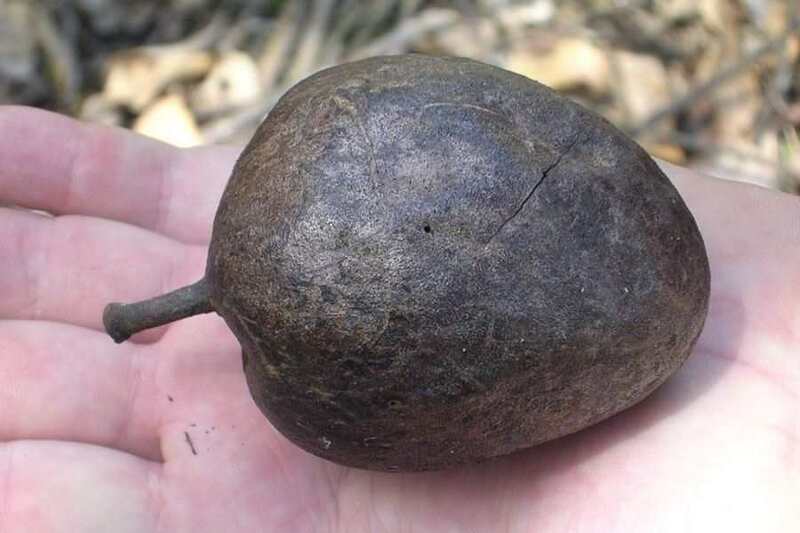 Pond apple (Annona glabra) is already known to have invaded 14 protected areas and 10 Wetlands of National Significance within northern Queensland, and is considered by some to be the most serious weed threat to the wet tropics bioregion. In particular, melaleuca wetlands and looking-glass mangrove (Heritiera littoralis) communities seem to be most at risk. Dense infestations can result in the replacement of mature stands of melaleuca with a monoculture of this weed, and a number of wetland areas and rare plant communities are considered to be threatened by this species. Many of these infested ecosystems are also habitat for rare and threatened flora and fauna, including several endangered orchids and the vulnerable ant plant (Myrmecodia beccarii). 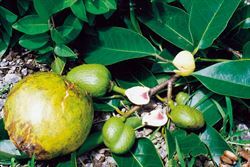 While pond apple (Annona glabra) is primarily considered to be an environmental weed, as it spreads it is becoming a threat to the sugar cane and cattle industries. Low-lying areas of agricultural land and floodplain pastures may be invaded during flood events, replacing more useful species and requiring significant effort to control. Thickets of pond apple (Annona glabra) along waterways can also restrict access and impede the movement of animals, humans and vehicles. New South Wales: Class 1 - a state prohibited weed. The presence of the weed on land must be notified to the local control authority and the weed must be fully and continuously suppressed and destroyed (throughout the entire state). Northern Territory: A - to be eradicated (throughout all of the Territory) and, C - not to be introduced into the Territory. South Australia: 11+ - Class 11 is a category for those species that are 'Weeds of National Significance' but are not otherwise declared in South Australia. Control of this species is not currently required in this state. Victoria: R - a restricted weed that cannot be sold or traded in this state. the National Weeds Strategy Strategic Plan for this species, which is available online at http://www.weeds.org.au/docs/ponstrat.pdf. the Control Methods and Case Studies Manual for this species, which is available online at http://www.weeds.org.au/WoNS/pondapple/docs/pond_apple_MM.pdf. pond apple (Annona glabra) flowers have three inner and three outer petals that are relatively broad. Its relatively large rounded fruit (5-15 cm across) have a relatively smooth and shiny surface. soursop (Annona muricata) flowers have three inner and three outer petals that are relatively broad. Its relatively large oblong or somewhat curved fruit (up to 30 cm long) have a shiny surface that is densely covered in slightly curved spines. bullock's heart (Annona reticulata ) flowers have only three elongated petals. Its relatively large fruit are rounded or slightly flattened (7-13 cm across) and have a shiny surface that is usually covered with an impressed network of lines (i.e. it is reticulate) and/or tiny projections. sugar apple (Annona squamosa) flowers have only three elongated petals. Its relatively small fruit (5-10 cm across) are dull bluish-green (i.e. glaucous) in appearance and covered in regular lumps. custard apple or atemoya (Annona cherimola x Annona squamosa) flowers have only three elongated petals. Its relatively small fruit (5-10 cm across) are dull bluish-green (i.e. glaucous) in appearance and covered in irregular lumps. Pond apple (Annona glabra) may occasionally be confused with some native mangrove species, as their stems and leaves are quite similar and they grow in the same habitats. 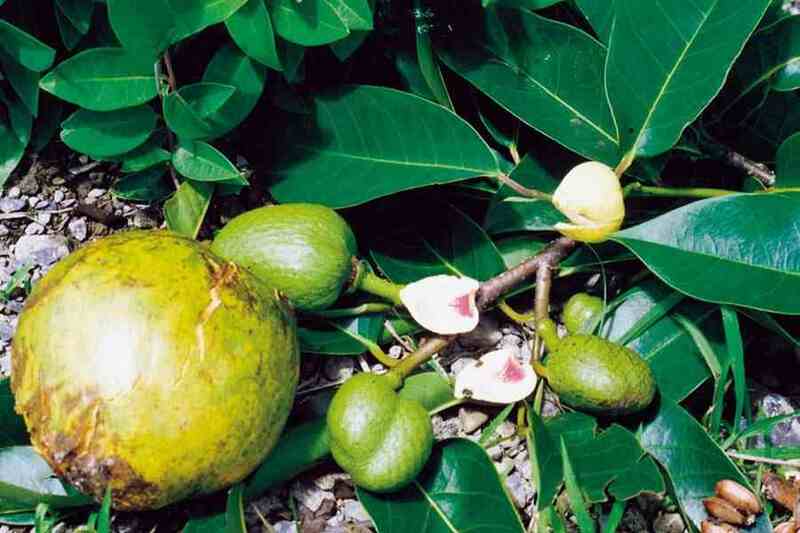 However, pond apple (Annona glabra) has quite distinctive cream and red flowers and very large rounded fruit.